Developing a solid referral base is the single most important and difficult task you face as a salesperson. Now you too can achieve results like the sales megastars. 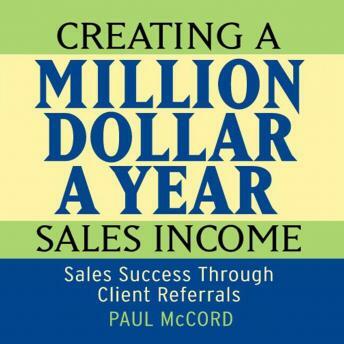 In Creating a Million-Dollar-A-Year Sales Income, master sales trainer Paul McCord sets out a detailed, yet flexible course of action that has been proven to generate referrals in virtually any sales system or environment and in any industry. This easy-to-listen to, conversational reference guide features compelling real-world examples of common sales mistakes and solutions that will transform lost opportunities into real prospects.